Discover the world of crafting canes and staffs. Learn from woodworker and author, Charlie Self, how to make simple creations or create a fancy "one of a kind" work of art. Fifteen projects are included in the book with step-by-step instructions, helpful sidebars,?and full-color photographs. This is a fun and easy to follow book. Included in the book is a guide to North American woods, 25 original carving patterns from renowned artist Lora S. Irish, and a stuning gallery of canes and walking sticks from the private collection of Albert LeCoff, executive director of the Wood Turning Center in Philadelphia. 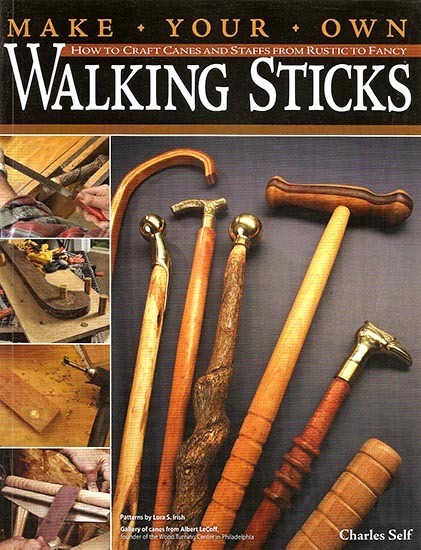 We like this book?a lot, especially the excellent pictures and explanations for stick making. Soft cover with 141 pages in color. 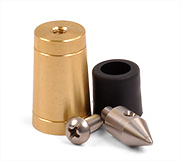 Cane - Brass Join 3/4"